I was in the crafting mood, making lovely things and actually filming video tutorials which are going to be on my You Tube channel this week no matter what they look like. I've realised that holding back for perfection is not really ever going to get them out there. I'd almost finished for the day and was starting to think about tidying up the carnage that is a mad crafting session's residue and then spotted that the month had changed and saw Joy of Sets Facebook group had a new colour challenge. It's PINK! This month's birthstone is Opal or Tourmaline so I guess pink is close. Anyway I couldn't resist. Even though I'm not the girliest of women I do love a good splash of pink. So I grabbed some materials not really knowing what I was going to do with them, sat back down at my craft table and made this card. I filmed the confused chaos of making it without any clue what I was really doing so that may appear on my channel soon but it wasn't rocket science to put it together. I used Blushing Bride cardstock to create my card base (8 x 6 scored at 4 on the long side) and then added mats and layers which grew smaller by quarter of an inch each time. Starting with Whisper White, then the gorgeous new champagne foil (which looks very rose gold when there is some pink about to reflect off it) and then another whisper white layer. Onto the top layer I stamped one of the two hedgehogs from a stamp in the Love you Lots stamp set (now retired but available on resale sites) and I used an aqua painter to add a dark pink to the little flower he/she is holding using Sweet Sugar Plum which is a very mauvey pink then I stamped the other hedgehog into a jar which I stamped using Blushing Bride ink onto Whisper White and cut out using the Jar of Love die and stamp bundle. 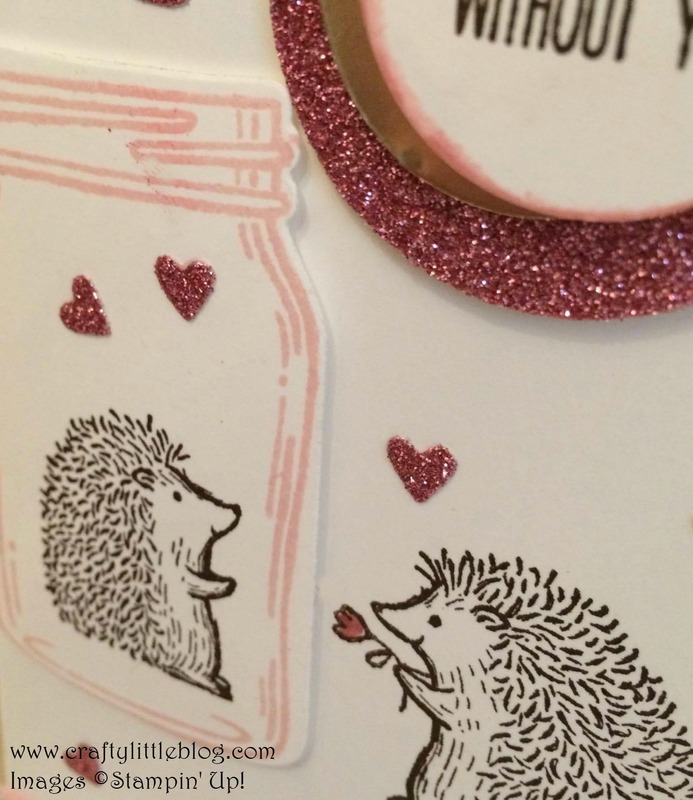 I also used the row of little hearts from that bundle to make some little heart shaped dots using Blushing Bride Glimmer Paper (sadly also retired but again I've seen it on resale sites and you can always colour some light coloured glimmer paper in using Blushing Bride ink if you want some). I just dotted these tiny hearts around using Tombow. 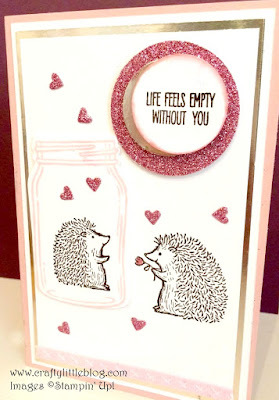 For the sentiment I used the "Life Feels Empty Without You" stamp from the Jar of Love set and stamped it using Early Espresso (which is what I used for the hedgehogs too). I used an inch and an inch and a quarter circle punches to punch out the sentiment, a disc of champagne foil and a disk of blusing bride glimmer paper and just stacked them in a haphazard fashion using dimensionals. To finish off I added a piece of Blushing Bride Double Stitched ribbon across the bottom of the top layer. This was more because I'd had to pop my jar on higher than I'd planned due to having made a mark on the whisper white so I needed something to just balance out the bottom as I'm not in the business of wasting paper products. Everything I used is listed below but do watch out for the video, to laugh at me being a disaster if nothing else. Go and check out the other entries or enter a card yourself on the Joy of Sets Facebook page or on the Joy of Sets Challenge blog. 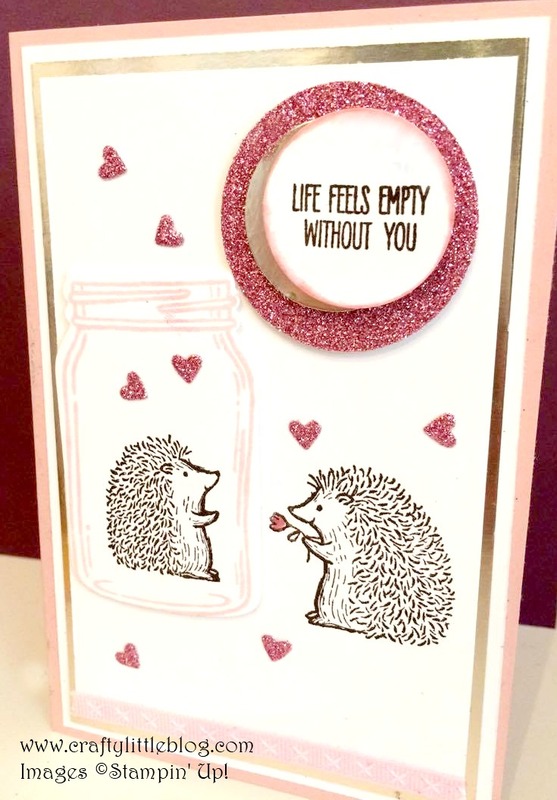 There are lots of crafty challenge groups and sites out there but I love JOS it's just such a supportive and non judgemental group so amateur card makers like me are just as well received as the super talented creative ones. Happy new week and happy new month!